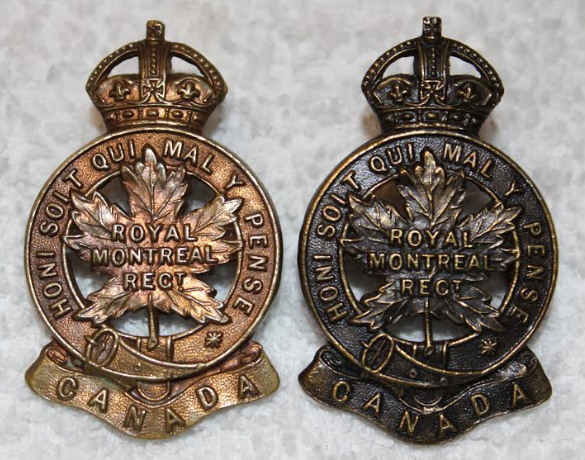 Although the Royal Montreal Regiment has been wearing the same cap badge for over 100 years, there have been many interesting variations produced over the years. Since the history of this venerable badge deserves to be known, we are lucky that an account of the birth of the badge has come down to us from eight decades ago. In early 1915, while the 14th Battalion, Canadian Expeditionary Force, was training at Salisbury Plain, in England, the unit was told it needed a distinctive badge to wear in France, in the front line. 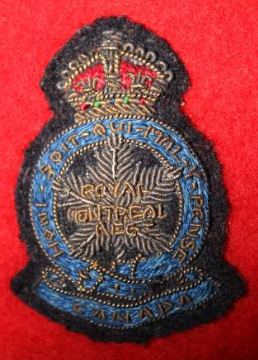 But what did it wear before that, during the five or six months after the 14th Battalion, known also as the Royal Montreal Regiment, was formed in August, 1914? 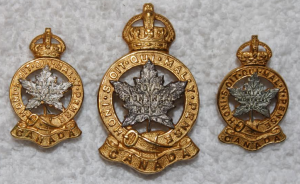 Some soldiers may have worn no badge at all, or possibly the Canada general service badge, which was in the shape of a maple leaf with a Tudor, or King’s, crown inside. 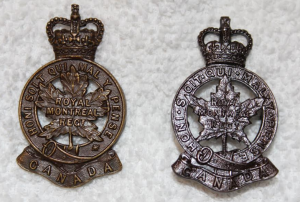 The three companies originally from the 1st Regiment, Canadian Grenadier Guards, likely wore their badge, as did the three companies from the 3rd Regiment, Victoria Rifles of Canada and the two companies from the 65th Regiment, Carabiniers de Mont-Royal. Those eight companies were sent from their parent units to form the composite, bilingual 14th Battalion in August, 1914, at Camp Valcartier, Que. The 14th was first commanded by LCol Frank Meighen – a CGG officer – and had an original strength of 46 officers and 1097 other ranks. During its stay in Valcartier, the 14th Battalion gained the unofficial designation ‘Royal Montreal Regiment.’ It apparently owes its name to Col Sam Hughes, the minister of militia and defence. Volume One of the regimental history states that Hughes started calling the newly-formed 14th Battalion the ‘Royal Montreal Regiment’ when the unit was getting organized in Valcartier with the rest of the 1st Contingent. Widely known and feared for his energy and capricious moods – he liked firing or promoting officers on the spot – few if any were prepared to argue with the mercurial minister. The name stuck, although official permission for the prefix ‘Royal’ was only obtained after the war ended. badges of the 14th Battalion, CEF. So who designed the new badge for the 14th Battalion? It seems to have been Lt Herbert Salmon, who worked in the orderly room as an NCO clerk at the time. He volunteered to “sketch out a few designs” since he was a “draftsman and designer,” he said in the July, 1944, number of the Intercomn, the newspaper of the RMR. This is certainly an endearing account of the birth of the badge, and who is to say it didn’t happen that way at all? But we know that Meighen did not have official approval to call the 14th Battalion a ‘royal’ regiment. In fact, that approval finally reached the 14th after the end of the war. Better late than never, as they say, but 6,270 men, of which 1,192 who never came home, wore the badge proudly. 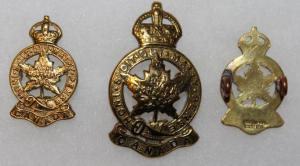 Three firms manufactured this badge during the war, according to the 1994 Charlton Standard Catalogue of First World War Canadian Infantry Badges. JR Gaunt Ltd of England made theirs of browning copper, William Scully Ltd of Montreal made it of browning brass and JH Tiptaft, of Birmingham, England, made it also of browning brass. The guide also lists Henry Birks of Montreal as a supplier. It does not mention an officers’ pattern badge. Eyelet posts, or lugs, along with a cotter pin, were used to affix the badge to the general service cap. One variation seen on ebay from time to time has a ‘slider’ instead of lugs, however. 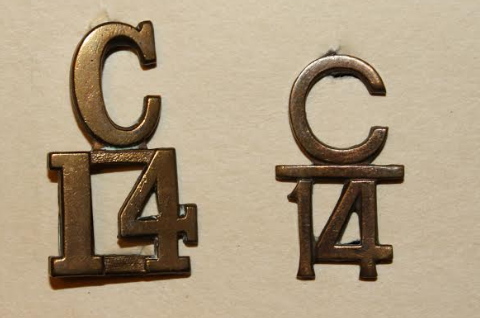 As for collar badges, miniature versions of the cap badge were worn by the officers, while the troops wore the brass C over 14 on the collars of their service dress jackets. Brooker, in his section on the RMR published in volume six of Brooker’s Badges of the Canadian Army (2015), also lists a brass shoulder title that featured CANADA curving downwards, surmounted by RMR, both words in capitals. It was worn at the bottom of the shoulder straps. An interesting variation of the officers’ collar badge recently came to light at a collector’s show in Ottawa, in April, 2016. It is made of sterling silver and has a most attractive appearance. Both lugs have been repaired but the initials of the maker can be seen on the reverse, as can two hallmarks indicating its sterling standard. Who ordered it and was it actually worn on a uniform? That is the fascinating thing about collecting: you never know what might suddenly appear out of nowhere. The heraldic description of the RMR capbadge, as described in a book published in 1964 by the Department of National Defence, The Regiments and Corps of the Canadian Army, reads as follows: “A maple leaf inscribed “ROYAL MONTREAL REGT” within the Garter and motto “HONI SOIT QUI MAL Y PENSE” surmounted by the Crown and resting on a scroll bearing the word “CANADA”. JH Tiptaft, evidently a large company during the Great War, boasted in an advertisement that since August, 1914, it had cut over 700 dies for CEF units. If you ordered one thousand, or more, of the same badge you paid 12 cents each, or $120. That doesn’t seem like a lot of money now, but a private in the CEF earned just a dollar a day during the First World War. Proud of serving in the 14th Battalion? Then why not give your wife, sister, mother or girlfriend a ‘sweetheart’ pin in the form of the RMR badge as a present? These were very popular in both the first and second world wars. They were smaller than the actual capbadge and were made in a variety of metals: gold, silver, platinum and brass. The front, or obverse, usually featured red and blue enamel. In fact, the RMR badge, in a variety of smaller sizes, was applied to lots of things: cigarette cases, cigar boxes, ladies’ compacts, just to name a few. All of these are very collectable, usually expensive and rarely seen. Interestingly, the 14th Battalion was one of only 13 units of the Canadian Expeditionary Force not to feature its battalion number on its capbadge. Out of 260 infantry battalions raised for the CEF, 247 did show their numbers. Those which did not are: the 7th, 8th, 14th, 22nd, 42nd, 87th, 90th, 144th, 190th, 231th, 245th, 259th and 260th Battalions. Some of these, however, did feature their numbers on their collar badges. The Royal Canadian Regiment, Canada’s only regular force infantry regiment, wore its famous badge with ‘VRI’ in the centre. That stands for ‘Victoria Regina Imperatrice.’ Princess Patricia’s Canadian Light Infantry, organized at Ottawa’s Lansdowne Park in August, 1914, had a badge with a marguerite flower in the centre. Hamilton Gault of Montreal, the founder of the regiment – he donated $100,000 to raise it – was married to a woman called Marguerite at the time. After the war, that badge was redesigned with the cipher, or initials, of Princess Patricia: VP, for Victoria Patricia. Historian Dan Mowat answered that question very well in his 2016 book One-Two-Three The Story of the 123rd Overseas Battalion, Royal Grenadiers, CEF. The story of CEF badges over the first three years of the war seems chaotic, to say the least. There seemed to be no official guidelines on designing and adopting badges and most units did as they pleased. The late JH Harper covered this in his 1999 book, A Source of Pride: Regimental Badges and Titles in the Canadian Expeditionary Force 1914-1919. 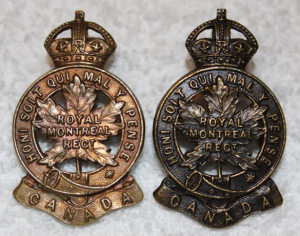 “Early in the war, badges were obtained by units raised in Canada by the authority of the officer commanding the unit, brigade or division. By May 1915 a process was being followed in some cases where the minister of militia in Ottawa approved badge design. The Author has not been able to find any formal documentation of this process throughout the CEF,” wrote Harper. On top of all that, Joe Harper wrote, there did not appear to be any documented process to obtain approval for a badge from the headquarters of the Overseas Military Forces of Canada (OMFC). Finally, Harper said, the authorities started taking the badge situation seriously near the end of 1916. On Dec. 10, 1916, Canada’s militia council decreed that only the general service maple leaf badge would be worn as a capbadge. C over numerals and a Canada shoulder title would also be worn. When that decision came out, there was a widespread and negative reaction from commanding officers of the CEF. Their distinctive unit badges were important to morale and a link to their home units, it was argued, and must be retained. Surprisingly, the defence council reversed its decision on Feb. 2, 1917. The badges, including the 14th, were safe for the rest of the war. 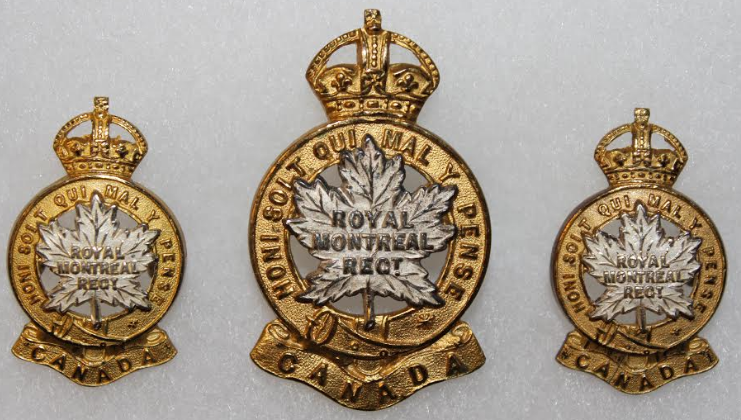 After the 14th Battalion demobilized in Montreal upon its return in April, 1919, its senior officers opened negotiations with the 58th Westmount Rifles to see if the RMR could be reborn for the post-war militia. The officers of the Rifles agreed to allow their unit name to be superseded and on Apr. 1, 1920, the RMR officially became part of the Non-Permanent Active Militia. Capt John H. Green, the adjutant, wasted no time in finding a source for the new unit’s cap badge, which was to be exactly the same as the 14th Battalion’s. He fired off letters to William Scully Ltd., J.R. Gaunt & Son (Canada) Company Ltd. and George Hemsley, Ltd. At the time the RMR trained in an old church on Stanley Street and its headquarters was above a chemist’s shop on St. Catherine Street, corner Greene Avenue, in Westmount. The unit later occupied its splendid new armoury a few blocks away, on Dec. 28, 1925. On Apr. 22, 1920, William Scully, then located at 320 University Street, in downtown Montreal, replied that it could supply 60 bronze officer badges at 65 cents each. 700 brass badges for the troops would cost 40 cents each and 500 other ranks’ brass shoulder titles, with RMR over CANADA, would cost 50 cents per pair. A day later, on Apr. 23, J.R. Gaunt, at 315-321 Beaver Hall Hill, announced that the officers’ ‘solid fire gilt badge’ was priced at $2. A pair of collar badges to go with it was $2.50. The officers’ bronze badge was 75 cents each, the brass badge for the men was 18 cents and the brass shoulder titles were 27 cents per pair. Last but not least, George Hemsley, manufacturing jewelers located at 7 Bleury Street, replied on May 5 that the other ranks’ brass badge was 28 cents each if 700 were ordered, the officers’ bronze badge was 35 cents if one half gross was ordered and the collars to that badge were 35 cents per pair if a gross lot was ordered. History does not record which company Capt Green ordered the new unit’s badges from. He’d had a memorable war, starting in August, 1914, when he arrived at the newly formed 14th Battalion as an original member – he was a corporal – of the contingent from the 1st Regiment, Canadian Grenadier Guards. After being awarded the Distinguished Conduct Medal, he was commissioned as an officer in early 1916. He was later awarded two Military Crosses for gallantry in battle. Later in the 1920s the officers adopted a scarlet mess kit uniform. Gilt and silver collar badges, miniature versions of the capbadge, were worn with that. Some officers also wore a blue uniform complete with a black tie and open collar. Its forage cap featured a silver and gilt badge, manufactured by either JR Gaunt or William Scully. By 1932, the design of the maple leaf in the middle of the cap badge had been changed slightly. The original badge displayed what can be called the ‘broad tipped leaf.’ Now the leaf featured sharp tips. The reason for the change is unknown. 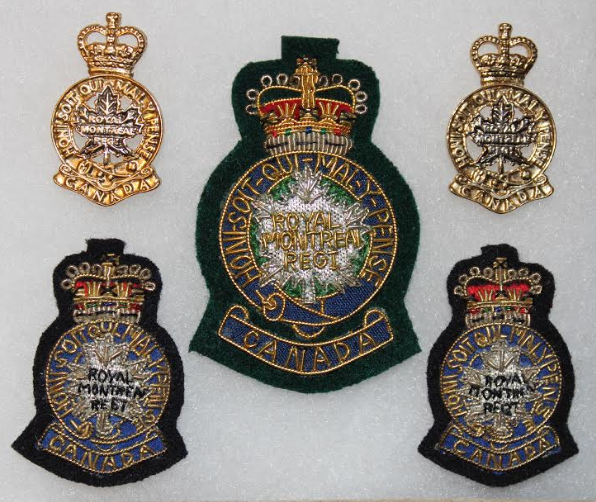 During this decade William Scully Ltd started making the badges and added periods, or dots, between each word of the motto HONI SOIT QUI MAL Y PENSE, which surrounds the maple leaf in the center. They are still there. It is interesting to note that all official depictions of the RMR badge, over the last 35 years or so, use the broad tipped maple leaf of the first war, yet the other ranks’ badge continues to show the sharp tipped leaf of the 1930s. From time to time a brass badge from the King’s Crown era can be found that was modified by the soldier who wore it. For some reason, certain elements in the RMR decided that making the maple leaf in center of the badge concave made it more attractive to wear. This was done, presumably, by putting the badge upside down in the drain hole of a sink, taking the end of a broomstick and forcing the center outwards. By the 1960s, this proved impossible to do as the Queen’s Crown badges featured a slider. Late RSM T.M. Kelley, M.M., E.M.
By: Capt (CSM) Geo E. Murdoch, E.M.
RSM Kelley was awarded the Military Medal for gallantry in action during the first war. He served as RSM of the RMR from 1927-30. Capt Murdoch, who is mentioned three times in volume two of the regimental history, obviously served more than a decade in the RMR before the second war. When the RMR mobilized on Sept. 1, 1939, he volunteered for overseas service. Four months later, on Dec. 21, 1939, he was listed as a platoon sergeant-major in ‘D’ Company. He survived the war and was later commissioned as an officer. Another way of showing your pride in serving in the RMR was to buy the blazer badge, made in gold and silver bullion. It was sewn on the left side of your blue blazer and usually worn with the RMR tie. Both King’s Crown and Queen’s Crown versions of this badge are known. The RMR kit shop continues to stock it and it is very well made. Sadly, few, if any, of the current soldiers seem to wear a blazer, complete with RMR tie, these days. During the Second World War, the troops kept shining their brass badges. 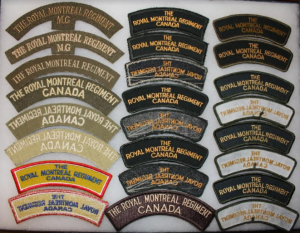 But after the RMR became the 32nd Canadian Reconnaissance Regiment in January, 1943, black berets were adopted and the officers wore gold and silver bullion badges on them. These are exceedingly rare. Before the flashes were introduced, the RMR wore a square type of khaki slipon. The first variation featured, ROYAL/MONTREAL. The second said, RMR/CANADA. They were quickly replaced by the full sized flashes, after the unit reached England. A major change to the capbadge occurred in 1952 when Queen Elizabeth II acceded to the throne and the Tudor, or King’s Crown, was replaced by St. Edward’s Crown, or Queen’s Crown. That meant the crown on the RMR cap badge had to be changed. In common with the rest of the army, it took quite some time for the new badges to be manufactured. In fact, it may have taken over ten years. In 1964, when the RMR received its third stand of colours, the officers had a group photo taken and only two or three wore the new Queen’s Crown cap badge! The army’s attitude was that current stocks of the Tudor Crown badges had to be used up before a new die featuring the new crown could be ordered. As for the shoulder flash, the RMR got its machine guns back after the war so MG was again seen on its khaki shoulder flashes. The unit revered to infantry in 1954 and the MG disappeared for a second time. In fact, the RMR’s khaki shoulder flash, worn until a coloured version with lots of yellow was adopted in 1968, was the only non-coloured flash worn in the entire army. In the 1950s and 1960s, the officers wore a bronze QC badge on their khaki forage caps, worn with both battledress and khaki service dress. Both sharp-tipped leaf and broad-tipped leaf versions are known. Gilt and silver cap badges and collar dogs were worn with mess kit and blue patrols. The RMR adopted the latter in 1954, the first militia unit to do so. Staff sergeants and above also wore brass RMR titles on the shoulder straps of their patrol jackets. Now, the Canadian army is to introduce the elegant blue patrol uniform once again, hopefully in 2016. During the immediate post-war era, the soldiers wore their brass cap badges on a scarlet beret while the officers wore a gold and silver bullion badge. When the RMR received their new patrol dress uniforms in 1954, it was worn with the scarlet beret. A blue forage cap, complete with scarlet band, was added to that order of dress for the troops by 1964. However, it appears that staff sergeants and above had been wearing forage caps with patrol dress since the middle of the 1950s. After unification took effect on Feb. 1, 1968, it took about four years for the militia to be issued the new Canadian Forces service dress, usually called CF greens. The officers continued to wear their gold and silver bullion badge on green berets and forage caps while the troops wore brass badges. When you got a new one you had to burn it black with a match or lighter before polishing it with Brasso. The army was now called Mobile Command – one of the six new commands originally formed in 1966 – and an attractive flash was designed soon after. It featured a red maple leaf in the center with four blue arrows pointing outwards to north, south, east and west. First worn as a cloth version on brassards, jackets and greatcoats, it was later worn as a metal badge on the right breast pocket of the CF greens jacket. It was replaced by the Land Force Command badge in the 1990s. By the end of the 1970s, RMR personnel were wearing anodised cap badges. No more polishing with Brasso. Happily, some dedicated soldiers kept wearing their brass cap badge, happy to display personal pride by shining it daily. 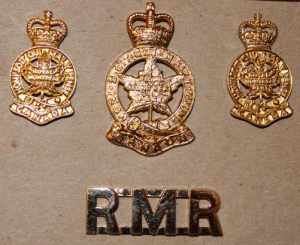 The RMR collar badges issued after the 1960s were not the best quality, both in design and production. The crown was too small in proportion and the finish looked cheap. The officers did not even have a collar badge with a silver maple leaf, as per tradition that had lasted 50 years. At least the RMR got its regimental buttons back in the late 1970s, at the same time that a full-size, gold on green shoulder flash was produced. The flash was worn on the service dress and work dress jackets, and later the garrison dress jacket. Small cloth tabs with the letters RMR were produced for slip-ons worn on the shirts of the combat, CF, work dress and garrison dress uniforms. A cloth badge, round, depicting the RMR cap badge was produced in the 1970s for wear on the bush cap in the field. Its maple leaves were so thin that some called it the ‘marijuana’ badge. A second version was produced years later. Now that the RMR and its soldiers have finished celebrating their centennial, with various events and celebrations that were held from 2014-2015, what are they wearing as insignia? The other ranks capbadge is still anodised, and very shiny. The collar badges, with pins, are well designed, for the first time since the 1960s. However, why are they curved? A large, anodised belt buckle is worn with the white plastic belt for ceremonial parades. In the 1960s, the buckle was square with the brass capbadge fastened in the center. As for the officers, their gold and silver bullion beret badge is well made. Their metal collars have a silver maple leaf in the middle, but the collars’ quality and finish does not even begin to compare with the classic officer gilt and silver collars worn until the late 1960s. For mess kit, both the officers and senior NCOs wear a miniature gold and silver bullion badge on both lapels of the mess kit jacket. For the Distinct Environmental Uniform (DEU) service dress jacket, which has been worn by all ranks since circa 1986, anodised RMR metal titles are worn on the bottom of the shoulder straps. Canada flashes are worn under them, near the top of both sleeves. On the right shoulder, the crest of 34 Canadian Brigade Group is worn under the Canada flash. On the left shoulder, the blue patch of the 2nd Division is worn. The Canadian army badge is worn on the right breast pocket. A nametag is worn over the left breast pocket. Slipons with RMR tabs are still being worn, on CF shirts and the CADPAT shirt and jacket. However, they are not worn on both shoulder straps, as you used to see with the old combat uniform of the 1970s. Instead, a single slipon made of the same material is worn on the front of the clothing. When a civilian decides to join the RMR and become a recruit, he or she does not automatically get the right to wear the RMR capbadge as soon as they start wearing the uniform. As late as the 1970s, or even later, recruits were issued the badge with the rest of their kit and wore it from the beginning. It only took a month or two to be enrolled back then. Now, a recruit wears the Canadian Forces badge – popularly known as the ‘cornflake’ – and must graduate from his or her basic infantryman course before gaining the privilege and honour or wearing the badge. This can take a year, or more. For example, if a recruit walks in the door in September, has all the necessary paperwork and passes the physical exam, he or she can be wearing a uniform and training on their recruit course about 6-8 months later, in the new year. Then they attend their infantry course in the summer and are awarded the RMR capbadge upon graduation. But some may take longer if they are not available for the necessary courses. It takes even longer for the officers to get their RMR badge. They are obliged to wear the Infantry Branch badge until they pass their phase three infantry course and are promoted to lieutenant. That directive appeared sometime around 2014. For example, an RMR officer could have enrolled on Jan. 1, 2016. He could have taken his Basic Military Qualification course from January to May, then taken phase two in the summer. Then, a year later, he’d do his phase three course in the summer of 2017, receive his promotion to lieutenant after he passed and started wearing the RMR capbadge afterwards. Total time elapsed: less than two years. However, this is assuming he is available to go on course and passes everything. How have the RMR’s brass capbadges been manufactured over the past 100 years? The process seems to have been pretty straightforward. Brass is a copper-zinc alloy and over time, brass items such as badges will tarnish. You have to polish them to keep them looking bright. Sgt Bob Anderson started polishing his badge when he joined the RMR in 1972. By the time he retired 23 years later, the words on the badge were so smooth they were unreadable. His badge glowed like the sun. After the manufacturer produces a design of the badge, a male and female die is made. A sheet of brass is put between both dies and enormous pressure from the press punches out the design from the sheet. This process, the most common used, is called die striking. Each new badge is trimmed of excess metal and, until the 1960s, two eyelet posts, commonly called lugs, or shanks, were fixed to the rear of the badge. You then made two holes in the beret or forage cap, pushed both lugs through and secured the badge with a cotter pin. By the 1960s, the rear of the capbadge was fitted with a ‘slide,’ which enabled the badge to simply slide into a hole made in the beret. By the end of the 1970s, the badges were plated with a coating that made polishing with Brasso unnecessary. Some manufacturers stamped their name on the slide: JR Gaunt London and J.R. Gaunt B’Ham. Recently, Scully has added the date the badge was made on the slide: WM SCULLY/2010. The slash / indicates that the date is below the name. As for the officers’ classic gilt and silver insignia, a thin coating of gilt was added to the badge. It was then ‘baked’ in a small oven, which is where the trade got the old expression ‘fire gilt badge.’ Then the frosted silver maple leaf, or overlay, was attached to the center of the badge. Screwposts were attached to the rear and secured to the clothing with a small, round wheel. The officers’ badge was also produced in bronze. 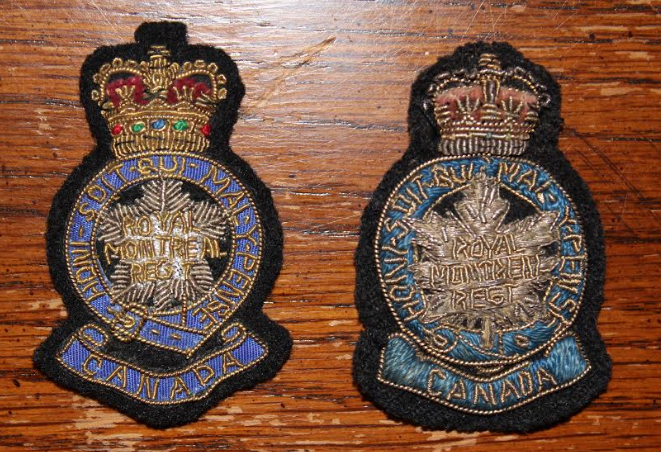 To sum up, the cap badge of the RMR has had a long and proud history. It has been worn by thousands of soldiers in both peace and war. Simple yet elegant in design, it is not as flamboyant as some other badges but it doesn’t need to be. The crown declares we live in a constitutional monarchy while the maple leaf – with the unit’s title on it – and ‘Canada’ at the bottom proclaims its origin and home. May it be worn forever! Breaking news: this just in! 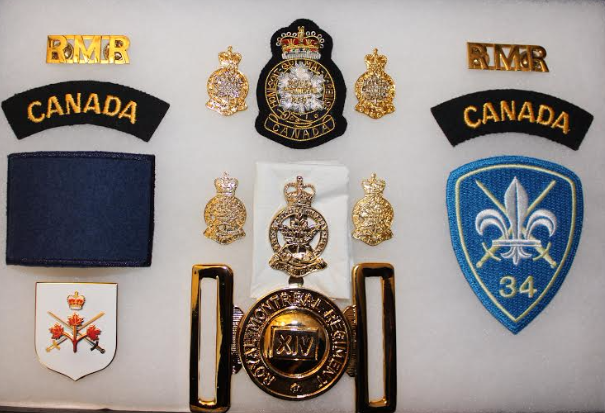 In a development that is sure to please and astound researchers and collectors all over the world, a new and hitherto unknown variation of RMR collar badges was discovered in Montreal in October, 2015. The collars are plated and feature St Edward’s Crown (although it is canted to the right and thus off centre). They are well designed but the interesting thing is that the back is flat, like the classic officer gilt/silver collars worn from 1920-70. The collars also feature screwposts, which have not been seen on RMR collars since the 1960s. Since then, the ubiquitous pin has been used to secure RMR collars to the lapel of the service dress jacket.